With those words, Roy Foss Chevrolet president Sam Alaimo welcomed the city’s best student-athletes to the second annual Vaughan Today Athlete of the Year awards breakfast last Thursday. Olympian Crispin Duenas was on hand to share what he’d learned on his way to becoming one of the world’s best archers: he placed 11th at the 2008 Beijing Games, Canada’s best-ever showing. To get to the top of his sport — one that that requires the steadiest of hands — he had to learn to be cool, he said. He’s even mastered how to drop his heart rate to a glacial 48 beats per minute just by thinking about it. But even the training of an elite athlete can falter. “I have to admit, right now I’m not that calm (because) I’m speaking to a bunch of people that have expectations, that know sports,” Duenas said holding out a shaky hand. Fifty of Vaughan’s top high school junior and senior athletes were nominated by their coaches as being worthy of Athlete of the Year recognition. Though all received hardware, only one was given the Overall Winner trophy. Four others took home top individual awards: Junior and Senior Male, and Junior and Senior Female. Despite his nerves — which can be calm enough to allow him to split an arrow with another arrow, a feat he’s done nine times — Duenas persevered. And perseverance, he said, is one of the hallmarks of a great athlete. 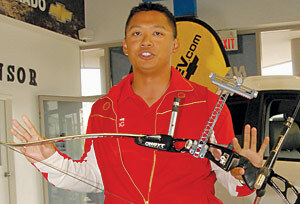 After failing to qualify for the Canadian Olympic team in 2004, Duenas said he could have given up and many would have congratulated him on taking his best shot. “Every year after 2004, even during the 2004 Olympics, I was ranked number 1 archer in the country,” he said. “In 2008, I had my chance again. … I went to the Olympic trials again, we had to go to the world championships, I had to do a top 30-something finish at the worlds. Like many of the student-athletes at the awards breakfast, Duenas has many talents and interests. The multi-instrument musician is currently studying at U of T with the hopes of becoming a high school physics teacher. Duenas’ kind of fortitude is something to be admired, Alaimo said. “Champions … understand that it’s not easy, it doesn’t just come to you,” he said. “You have to work at it, you have to practice time in and time out, and you have to make sacrifices.